The sail into Santorini is always exhilarating – looking up at the massive cliffs with the whitewashed buildings perched on top, as well as the wind gusts and constant changes of wind directions. Santorini is still an active volcano and I read somewhere that it is the biggest caldera in the world. Always good to sail through an active volcano. Like Mykonos you would think that Santorini would have a good marina. Even an average one would be good. But all they can muster is a fishing boat harbour, miles from the action, crammed full of catamarans that they do day tours on. We had to beg to get 3 days on the wall and for 2 days we had a 27 tonne Catana hanging precariously off our outside cleats in 40kts of wind. Snapped one of my mooring lines and chaffed another before we could get some lines directly from the Catana to the wall to help relieve the pressure. George, the captain of the Catana, from Crete, was most apologetic about it, and turned out to be a lovely guy. Santorini is simply stunning. Being in the marina we had to rent a car for the whole duration, and we used it to good effect, visiting some places we’d been before (on my previous two trips) and some others that were new to us. We of course checked out Fira and Ioa: Ioa for the sunset. In Ioa we “discovered” pool bars, where, for the price of a drink you can swim in a nice pool and enjoy a stunning view. No need to book into an expensive hotel to do this. This was a great precursor to the sunset show, where a big crowd gathers each day to watch the sun disappear in the west, and then applaud it doing so. Slightly weird – clapping the sun. Santorini is making some good wines these days and we did a bit of a wine trek. I was determined to find Gaia Winery, which Sean had prepped me on as they export into Australia. We found it on a lovely beach on the East side of the Island, and enjoyed a great tasting overlooking the Med, followed by a short wine tour. We walked away with our wine stocks restocked with a couple more cartons. We also checked out Santo Winery, mainly for the stunning view. 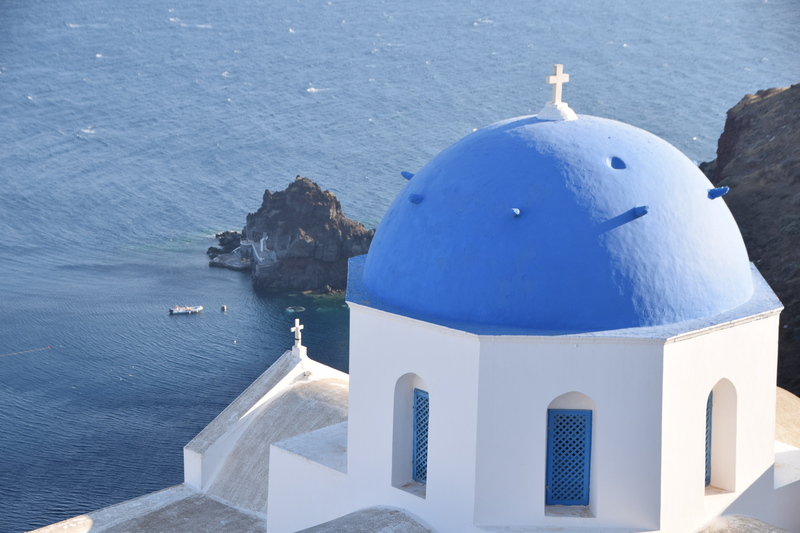 We added the old port at Ios, Pyrgos and Ancient Thira to our list of personal Santorini highlights. Pyrgos had a great Castle and Church that we climbed up to through a cute village. Ancient Thira is perched on the top of a mountain, that you reach by driving up 30 odd switchbacks and then walk up a further 500m. Its breath-taking when you finally get, looking down at planes landing, and across to all of Santorini’s beaches. The ruins are also worth a look, and all in all, somewhere really worth adding to your where to go in Santorini list. As far as old favourites went, we revisited Red Beach (good) and Ancient Akrotiri (not so good the second time round), and to the boys went out to the island in the middle, where there is still some smouldering sulphur. Dee and I took the opportunity to search out another pool bar, a 30 minute walk north from Fira, where the Mojito’s are made even better by a stunning view. The boys and I also did the obligatory donkey ride up from the port – Dee however would have nothing to do with it, preferring instead to stay firmly planted in the pool bar. 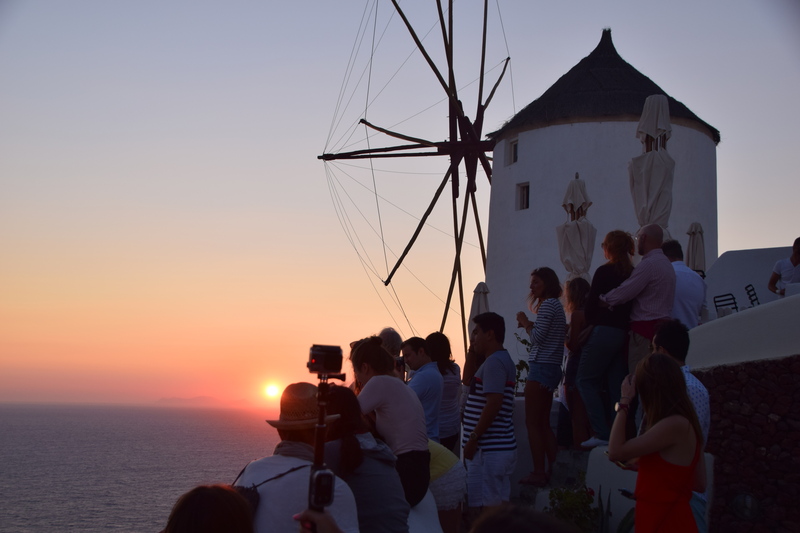 Santorini comes alive at night and we enjoyed a few delightful meals in restaurants perched on the side of the cliffs, enjoying the magical light show from all the other restaurants similarly perched on cliffs around us. Santorini was where Alex and Milo left us, Alex to fly back to Sydney and Milo to continue onto Serbia. It was a great few weeks with Alex (and Milo) and we had a great time taking lots of photos and getting up to Mischief. This entry was posted in Greece and tagged ancient thira, fira, gaia, ioa, pyrgos, santorini by stull61. Bookmark the permalink.